Lots of pictures of rigs get sent in here, all hoping for a place in that coveted section known as the centerfold. Everyone loves their bike like a child. Thinking it is so beautiful when maybe it is just average looking. The pictures come in, some without any words, others exclaming the incredible picture I am about to open is surely the sweetest two wheels that ever rolled the earth. This one at right came in with the simple subject "Centerfold Candidate? ", no proclamations of greatness included. I was speechless. It is not centerfold material. Just like the flesh merchants we must only take the best looking. The world is superficial like that. But, it deserves a look for it's uniqueness alone. It stands out, existing as it is and surely loved by it's owner as deeply as that ugly child who's mother just can't see what everyone else does. Or maybe they see something the rest of us don't, the beauty that is not skin deep. And for that, it's earned a spot on this page. Of course, I suppose we should not forget the old saying "beauty is in the eye of the beholder" either. And I am always one who touts function before fashion, so one should keep that in mind too. I'm going to let someone else get a word in for a change. 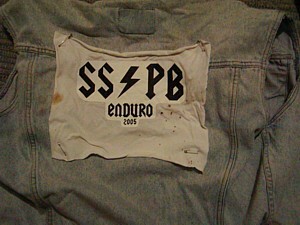 Check out the excellent pix and play by play reports of the SSPBE 2005 by Steve and Al. 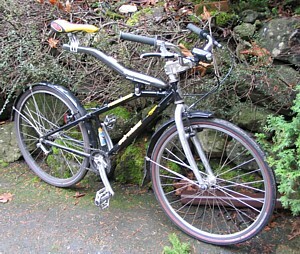 Well, the 2005 Single Speed Punk Bike Enduro is in the bag. 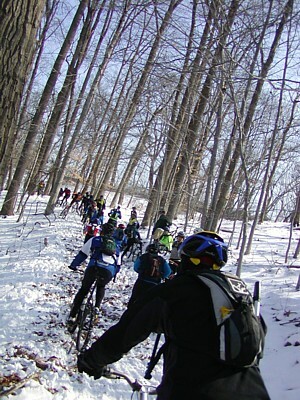 Forty plus SSers showed up to ride in the snow, test their skills and vie for the coveted Sid and Nancy awards. More later kiddies, it's been a whirlwind weekend with my coffin biting the dust right before the event. I'll post pix and words about this little ride in the near future. And I'm sure some others will report in with their own tales and photos. Thanks to all who helped out and thanks to those who showed up.